A court in Sri Lanka has banned Gotabhaya Rajapaksa, the former president's brother and defence secretary, from leaving the country. Police are investigating a boatload of weapons belonging to a private security company set up by Mr Rajapaksa. The company says the weapons were for escorting commercial ships, but police say they have had complaints the firearms were used for intimidation. Mr Rajapaksa and his brother Mahinda, the former president, deny wrongdoing. 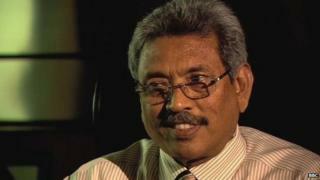 A magistrate in the southern port city of Galle impounded Gotabhaya Rajapaksa's passport, along with those belonging to three others, AFP reported police as saying. "Police investigating the Avant-Garde Security Service floating armoury case sought and secured a ban on their travel abroad," a statement said. The discovery of a floating arsenal off southern Sri Lanka, and of another weapons haul in the capital, came in the days after Mahinda Rajapaksa was voted out of office in January. Police are reported to have found a ship carrying more than 3,000 weapons, including machine guns. The BBC's former Colombo correspondent Charles Haviland says this is not the only accusation dogging Gotabhaya Rajapaksa. An ex-minister who served in the same government has alleged that he was responsible for abductions, and for killings including that of a newspaper editor, Lasantha Wickrematunge. This is the first restriction placed on his movements. "The reports on travel bans imposed on the former defence secretary and some former senior members of the armed forces regarding a criminal investigation that is taking place will be welcomed by all those who wish [for] rule of law to prevail in Sri Lanka," said Basil Fernando, director of the Asian Human Rights Commission.